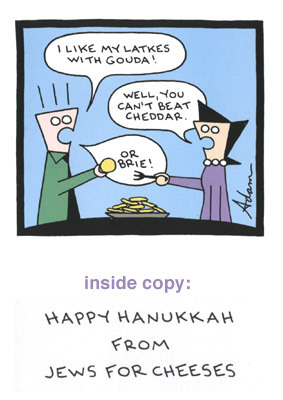 GC009 - Jews for Cheeses Hanukkah Card: Another cartoon that first appeared in the Hollow Days book and then became a card with Recycled Paper Greetings. Again, although punny, I’ve always liked this one. Perhaps you’ll feel the same. Enjoy, at the not unreasonable price of $1.95 a card.